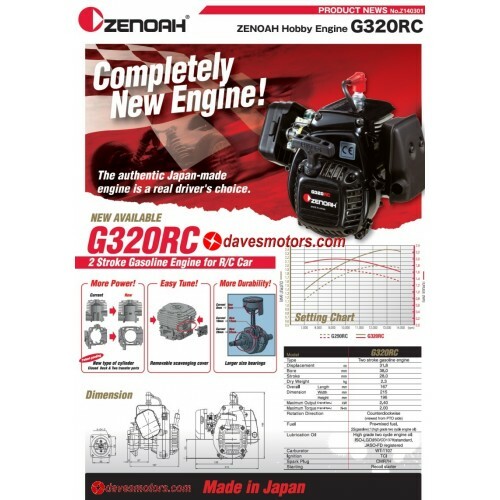 This Zenoah G320RC engine has a 38mm bore, and 28mm stroke, for 31.8cc in its stock form. Includes a revolutionary new cylinder design with closed deck transfer ports (two piece), with removable covers. 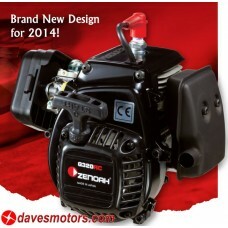 The release of this Zenoah G320RC engine is the biggest news to hit the R/C engine world in years! We have been testing this engine for the last few months, and the power output is incredible. HP: Approx 3.5 or more (before adding tuned exhaust). 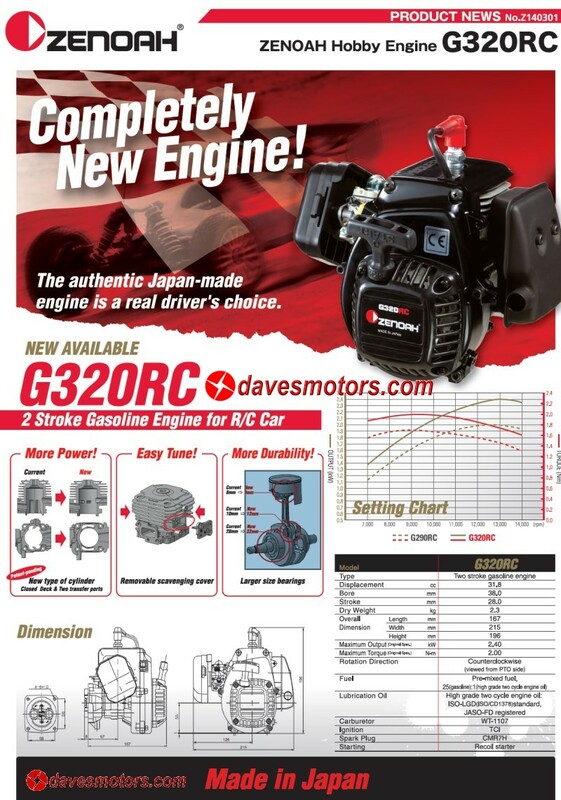 The G290RC is commonly listed at 3.5hp, but this engine puts out considerably more power than the G290RC. Adding a tuned exhaust or other modifications will further increase horsepower and torque numbers. HPI Baja 5B/5T/5SC, Losi 5ive, Losi Desert Buggy XL (DBXL), FG Modellsport, Redcat, Go-Ped(clutch driven versions only), Heli, and more! For Go-Ped use - This engine will bolt on and work on existing 54mm clutch models. Will work on spindle drive models only if ADA clutch is used (part gt201). This is a complete engine - including carburetor, air filter, clutch, and muffler. The crankshaft is a different style (larger) than the original zenoah engines, so the existing +2mm stroke crankshafts on the market will NOT be compatible. But, crankshafts compatible with this engine are in development, and will be available from DDM in the next few months. With a 2mm stroker crankshaft installed, this engine will become a Zenoah G340RC Engine (38mm bore, 30mm stroke, 34.02cc) performance beast!!! The exhaust port spacing is the same as the original engines, so all exhausts, tuned pipes, etc will remain compatible. The cylinder includes removable transfer port cover plates, these plates can easily be removed for easier access to the transfer ports. Along with the engines, we will have the complete line of stock/replacement parts arriving also. In addition to the stock parts, upgrades such as the following will be available at DDM very soon: +2mm stroker crank, billet aluminum insulator manifold, copper gaskets, billet aluminum crankcase, etc.